BowEcho is an absolutely bonkers plugin, capable of darkly beautiful and terrifyingly horrific things in equal measure, and at this price, it shouldn't go unmissed by any producer of electronic music. Thoughtful, slightly nuts approach to sound mangling. Good value. Patching could be more intuitive. Billed as a "modular sound mangler", BowEcho is a VST/AU plugin capable of generating a broad range of effects and even making sounds of its own without external input, using its four delay lines, four LFOs and four mixers. "Every one of BowEcho's many input menus can accept the output of any of its 12 modules"
Patching is done via menus rather than a graphical cabling system, so it's not immediately intuitive, but what makes BowEcho such an intriguing proposition is that every one of its many input menus can accept the output of any of those 12 modules - it doesn't get much more modular than that! The delay modules feature separate inputs for the delay line itself and the feedback circuit, enabling the latter to be processed by other modules. Unsynced delay times run from 0-1000ms, while synced they go from 1/128 to one bar, and the third input on each delay permits selection of a modulation source for the delay time. The LFOs run at up to 40Hz (host-synced or not) in standard mode, and up to 4kHz (ie, well into the audible range) with a click of the x100 button. Sine, square, saw up/ down, triangle and S+H are available as waveshapes, and the LFO rate is targetable for modulation. In between the delays and LFOs sit the four mixers, which aren't just for 'mixing'. They can be used to mix pairs of signals, but their other modes introduce ring modulation, gain adjustment, stereo splitting and low-pass filtering. 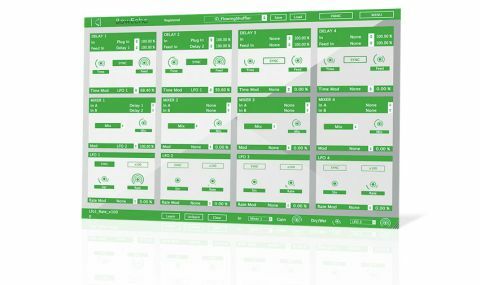 By shuttling your signals around between delays, LFO and mixers, all manner of processes can be drawn on, from simple or complex delays to weird flanging, chorus and other 'short-delay' effects. The results are often unexpected, and the potential for confusion is considerable, but once you get used to those routing menus (and remember to assign your final output correctly - we had a few head-scratching moments until that one finally sunk in), BowEcho actually becomes pretty easy to use. And fortunately, the output is automatically clipped in order to keep the inevitable infinite feedback loops under control.